A favorite YouTube video that I discovered last fall at the beginning of my creative journey is from Joanne Boon Thomas. 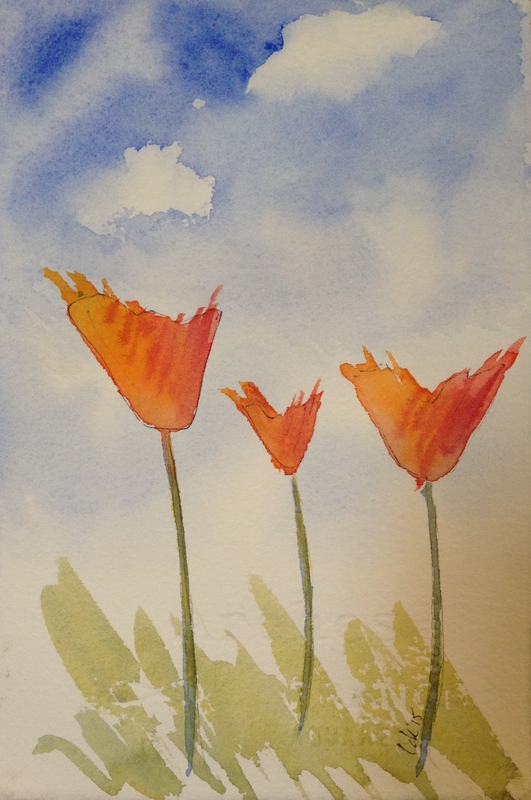 In the video, Joanne shares her impressionistic, loose style as she paints poppies. I’ve tried a couple of times to paint poppies the way Joanne does, and I enjoyed it. This time though, I decided to take what I’ve learned from watching Joanne, and paint the flowers in a way that feels right to me. I wanted to convey a feeling of light, of freedom, of the wind through the field flowing through my hand and my spirit as I painted. If I’ve succeeded in bringing light into your day today, then I’ll consider that I’ve accomplished something as an artist this time out. And I’ll hope for further expressions of this same kind of joy and freedom in future explorations of this delightful medium that I’ve grown to love so much. Happy Saturday, and may you find time today for something that gives you the same feeling. Peace and light. Laura this may be my fave so far! I’ve done that Joanne Boone also. In fact did it at the beach this week. Love her style! But here you took what you learned and made it true Laura style. I feel you on this one great job! Oh I sure did shake it!! Awesome!!! Do you love her??? She has one on sunflowers that is so cool, it’s been shouting your name since I first saw it. Her style is the same in whatever she does, and boy do I want to find mine. I do want to be realistic but not pinned to fine details….but yet I’d like to do detail work too, just to try it out (when I have more skill, obv.) Anyway, just wondering and wandering in my mind, as thinking about Joanne’s paintings always do! Did you enjoy her methods?? Seems it would be right up your alley! Yep. Love her style! 😍. I know what you mean though about wanting to try detail too. .. It would feel so “tight” though!!! And I’ve worked so hard to loosen up lol! In this one I meant to say. Sorry. iPhone while traveling. 😕. Heading home. Another one that would make a great card. Happy! Oh, yes – “Laura style” and would make a great card. Glad you are having fun with your art. Goal accomplished Laura – your painting is beautiful. Is now one of my favorites of yours. Have a wonderful weekend. Wow, thanks Mary! I appreciate that!! I hope you frame this piece! The sky is wonderful with the poppies are swaying in the breeze. Thanks, Carmel! I’m glad you like it. I’m starting to experiment with making small paintings for sale….maybe Etsy? Not sure. But this would be one. I’m glad it’s getting such nice feedback! You bring light into my day every day, my dear! These definitely convey lightness and freedom. Just lovely! Thank you, Tori! I’m wondering if the flowers need punching up. Looking at this the next morning, thinking more vibrancy might be nice. I’m quite fond of splatters to add vibrancy 🙂 I’m looking back at some of my paintings now and wanting to adjust/play around with them. I’m not sure if to leave them be and move onto something new or see if they can be improved! Tori, I always tend to move on, so I know exactly what you’re saying. I’ve been trying to do a small WC sketch every day this month, so there’s always another one to move on to! Very nice — Love that sky!!!! Beautifully poppies California state flower. Thanks, Julie! Glad you like them. They’re fun to paint! Love the simplicity. It doesn’t need anything else except maybe a frame and a place on the wall!! Nicely done Laura. Great style. Thanks, Wayne! I appreciate that. Those poppies are quite lovely. I can imagine a child running by. What a free/freeing picture. I’ve been spending everyday with my camera, but have been sketching a landscape. I’m booking-marking all the tutorials you mention or link to so I can find them. Thank you! Awesome, I’m thrilled to hear you’re working on a picture!